I say it is a matter of heart my husband’s in its faltering, in its failure to keep pace and my inability to understand the penetralium of this place of this tectonic shift, the earth in its constant state of change. Here on the 8th floor 1305 York Avenue, NYC 10:00 a.m. he arrives for an echocardiogram and pre-op bloodwork. Here in the Waiting Room, consider stylishness, the comforting cool blue-gray walls, the magazines, none dated 6-8 months ago. Waiting rooms are a large part of a patient’s healthcare experience. Do not consider others who wait: those in wheelchairs, those hobbling with canes or those who are young and seem not to belong in this realm of Faltering. I am married to a Brit; he is not au fait when it comes to determinations of blood, and though I plead with the air, I bloody-well don’t want his heart put out to pasture. The procedure will take 3-4 hours; I reckon time, check my chronometer, my knowledgeable Apple that will keep pace, consider physics: scalar quantity but no direction. Before clocks and Apple watches there were always shadows cast by gnomons dark spaces like this space my heart habits in the surgical waiting room. In 11 B.C., the shadow cast by a sundial was noted in Nine Chapters on the Mathematical Art.” “Art” is embedded in “heart and time is a dark shadow of waiting a feeling of dread. I want to turn back time some 40 years. I want to be in New Orleans ride the streetcar named Desire on my way to hear (and hear, too, is embedded in “heart”). We are in the French Quarter in New Orleans. I feed him oysters drink a Pimms Cup or two and listen to Lizzie Miles of Faubourd Marrigny sing “A Good Man Is Hard To Find.” And there he is, that good man of mine there we are not merely as pieces of existence – but existence as a whole. Sue Walker, M.Ed, MA, and Ph.D., is the publisher / editor of Negative Capability (Mobile, Ala). She was Poet Laureate of Alabama from 2003-2012 and Stokes Distinguished Professor of Creative Writing at the University of South Alabama where she retired in July 2015. In 2013, she received the Eugene Garcia Award for outstanding scholarship by the Alabama Council of English and a Mellen Award for outstanding scholarship for her critical work on James Dickey, The Ecopoetics of James Dickey. She has received several Pushcart nominations and numerous creative writing awards for fiction, non-fiction, drama, and poetry. She has published eight books of poetry, numerous critical articles, drama, fiction, and nonfiction. She has spoken and given workshops throughout the U.S.A. and abroad. Sue is the President of the Alabama Writers’ Conclave. Editor’s Notes: This is a beautiful love poem with an experimental layout that echoes the title, as well as a troubled heartbeat. 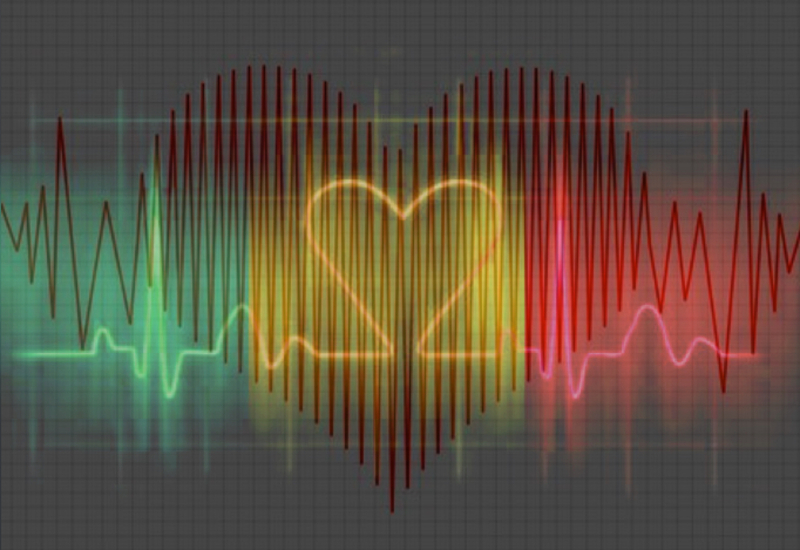 Two images are superimposed: a multicolored “One Love EKG” and a more clinical EKG softened by a heart (Pinterest).